What is a Gentle Dentist? Welcome back to the Mystic Oaks Family and Cosmetic Dentistry blog! 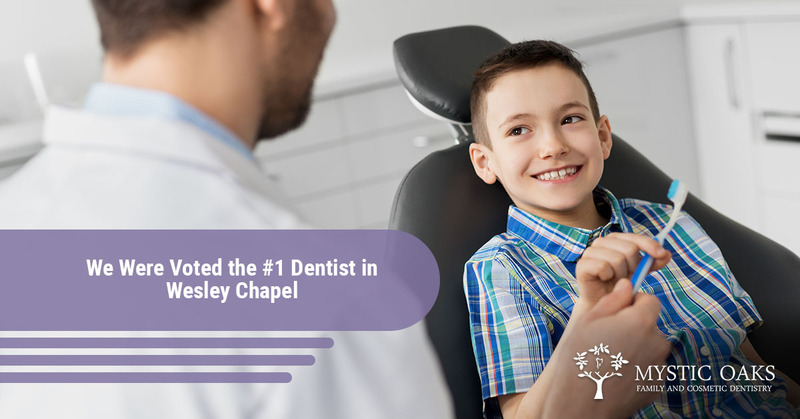 In our last blog post, we were happy to announce that we have been voted the number one dentist in Wesley Chapel! We are honored to receive the recognition and hope that whenever you search “dentist near me” that you will always choose our family dentist. To make an appointment be sure to visit our website or stay right here to learn more about how a gentle dentist can help you! For some, going to the dentist is a routine. They have been going to the dentist since they were a child and they look forward to the fresh, clean feeling after their cleaning appointment. However, there are some that would rather do anything else than go to the dentist. No matter what your reservations about going to the dentist are, your feelings are valid and there are solutions that our dentist can offer you so you can enjoy pristine oral health. Being afraid of the dentist is quite common. According to a Colgate article, 30-40 million people have anxiety about going to the dentist; that means that 15 percent of Americans dread going to the dentist. At Mystic Oaks Family and Cosmetic Dentistry, we focus on providing a warm, caring environment and meeting the needs of our patients that require gentle dentistry. Why? We feel that no one should be without dental care. Dental care affects every aspect of our overall health and should never be considered optional. What Does Our Gentle Dentist Provide? Dr. Prematee Sarwan offers gentle dentistry to Wesley Chapel because she truly cares about her patients. Through investment in cutting-edge technology, pain relief options, and more, she and her staff can help reduce your anxiety about the dentist and provide a comfortable experience every appointment. Whether you are coming in for a regular cleaning or for a more extensive procedure, you can always expect us to exceed your expectations when you need gentle dentistry. We understand that some naturally find it difficult to go to the dentist. If you are afraid of the dentist or have severe oral sensitivity, let us know when you make your appointment and we would love to accommodate you. Aside from providing the best dental care, our patients and their comfort is our number one priority. Whether you are searching “dentist near me” or specifically looking for a gentle dentist in Wesley Chapel, we would love to take care of you. Call us today to make an appointment! 3751 Bruce B. Downs Blvd.